Maps can be a fantastic addition to your website or application. The coolest of which are slippy maps: ones you can scroll or zoom interactively, the most famous of which being Google Maps. For the amateur or cost-conscious engineer, however, many of the common slippy maps (Google Maps, MapBox, etc.) can be expensive. What you're actually paying for is access to sophisticated features, rich data, and hosting/bandwidth that each of these service providers have painstakingly built. But not all projects need these options: if you're building a small, low-traffic website that requires only a simple map, these enterprise-minded products may add value for which you cannot justify the cost. But frugal and open-source saavy software engineers rejoice! There is an open source, virtually-free* solution for those who require a map with basic features. In this article, we'll cover the steps to setting up your own map. A means of serving the map to our visitors at great speed and minimal cost. TileMill: An application for styling and generating map tiles. So if you're ready to roll-up your sleeves, and dig in, let's go! A typical, static map is just an image; nothing fancy there. Slippy maps aren't too dissimilar, but have a special requirement that the user be able to pan and zoom to various levels of detail. If we only had one image in our map, it would need to be massive to accommodate detail when zoomed in, or otherwise remain blurry at high-power settings. The slippy map solution is to break a map into a set of tiles, images of smaller sections of a map, which can be pieced back together on a grid to form the whole map. There are a different set of tiles for each zoom-level. When zoomed out, you require fewer tiles to complete the map, but with each higher-power zoom, you require exponentially more tiles to complete the map. We pre-generate all of the tiles and store them somewhere, which requires a lot of storage space. We generate map tiles on-the-fly as the user requests them. If the user requests a tile we've already generated, we serve back a stored copy. Option #2 has a lot of drawbacks: although it saves on unnecessary storage space, it requires a server dedicated to processing tiles on-demand, can be slow under load, and very expensive. It's typically reserved for users with advanced needs. For the purpose of this article, we'll cover Option #1, since storage is cheap and plentiful, and it allows us to make the entire map static. This means no web-server, and option to scale massively, quickly, and cheaply by leveraging the power of cloud-based CDNs. First, we'll need to generate all of the tiles we need for our map. 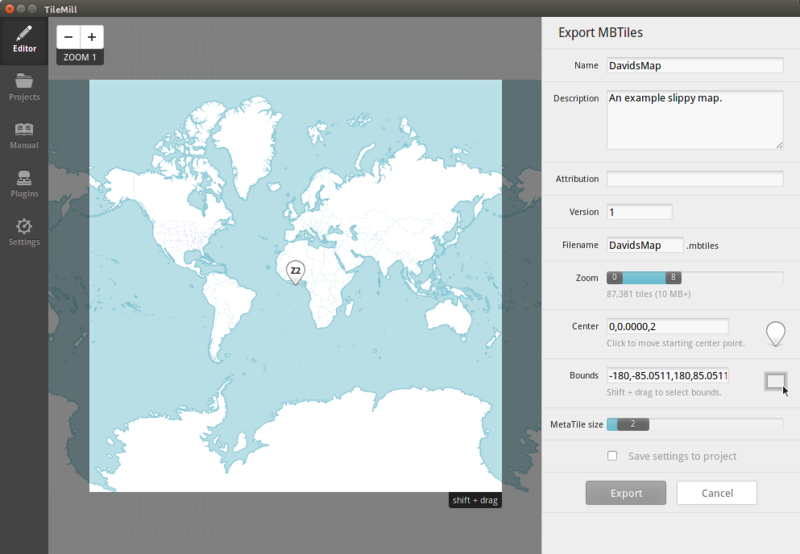 Download and install TileMill from MapBox, which we can use to design the style of our map. Launch the Studio and click New Project, give it a name, and click Add. 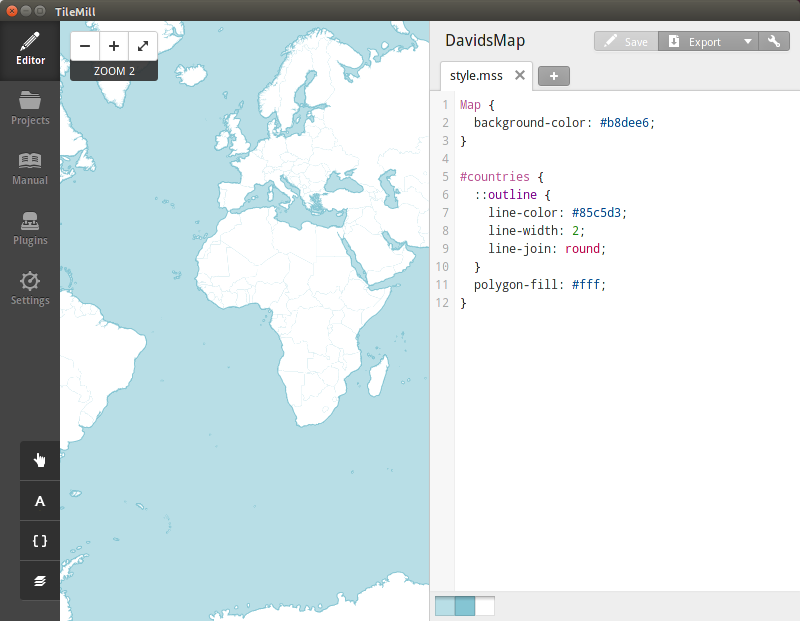 Now we land on the Editor screen for MapBox. On the right-hand side, the editor panel for changing the styles of the map, and on the left are the map tiles with the applied style. These tiles are static images, and have all of their visuals baked into them: this includes roads, names, geographic features, colors, and other aesthetics. These will chiefly compose the style of your map, so we should style them with all the visuals you require before generating the tiles. To style them, we use a language called CartoCSS, which itself is not too different than CSS. The principle of selecting elements and applying styles is same, but includes the new concept of layers: data that describes geographic elements (like lakes, borders, etc.) We can select data within a layer and apply styles to further customize the look and feel of our map. Let's try adding a style. The US doesn't have any state borders drawn on the map, so let's add them. In the bottom left corner, click the Layers icon, and click Add Layer. Click Save to add the layer. 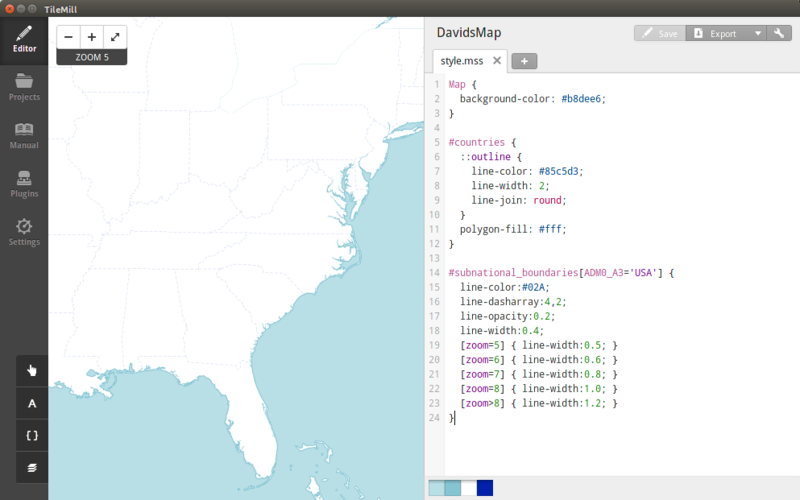 You should now see that TileMill drew the state border for the US for you: pretty neat! There are a lot of more advanced things you can do with CartoCSS to style your maps, especially if you have shape data to accompany it. Interested readers should check out the CartoCSS documentation or an example project for more inspiration, but for now, we press on. Now that we've styled our map how we like it, its time to export it into tiles. Click Export then MBTiles option from the menu in the top-right. Here you can adjust your map's settings. The most important of which is Zoom. The larger the range of zoom, the more tiles and greater the map size. When ready, click Export, which will begin generating the tiles. When finished, Save the .mbtiles files to the place of your choosing. Our tiles are now exported, but they are in MapBox format: unsuitable for the web. We'll need to convert them to images. The MBTiles file you've generated has all our imagery packed into it, but now we need to convert them to PNG. To do so, we can use a handy library called mbutil which is capable of converting MBTiles to PNG. mb-util -h to verify it worked. 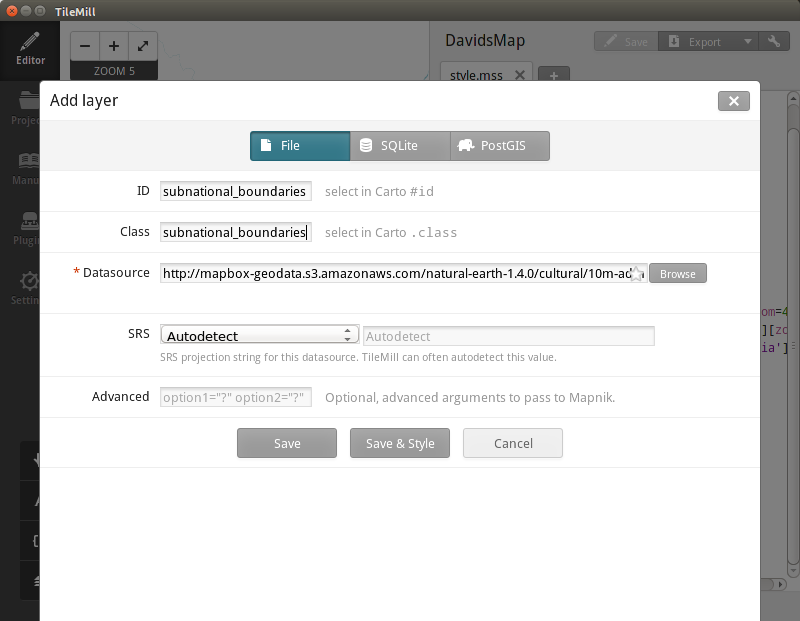 It will generate a folder, in my case DavidsMap, which will contain all of your map tiles in PNG format. Each numbered directory represents a zoom level of tiles. In my example, I generated 9 zoom levels, that in total are about 34MB in size. Not bad! We have our tiles, and now we're ready to add our slippy map to our website. For testing purposes, we'll want the website to serve the tiles we just generated from the local file system instead of a remote CDN (that comes later.) If you are using a web server for your application, copy the tiles directory into the public directory such that they can be accessed by a http:// URL. For Rails applications, this is typically the public directory. Now we're going to utilize LeafletJS, an awesome open-source library that will load and render our map tiles on our web page as the user pans and zooms. NOTE: The URL should be the path to your tiles as served by your web server. In my case, I was running WEBrick on port 3000, and the tiles directory was in public. And there you have it. Your very own, custom interactive slippy map. There are many more settings and features you can play with to make the map more useful, as outlined in the documentation. But now it's time to get it out there on the web. This next section is optional: it outlines a strategy for deploying your slippy map to AWS, so that your tiles may be served in a very fast, very cheap way. If you're an AWS customer, and this sounds like gravy to you, then read on. 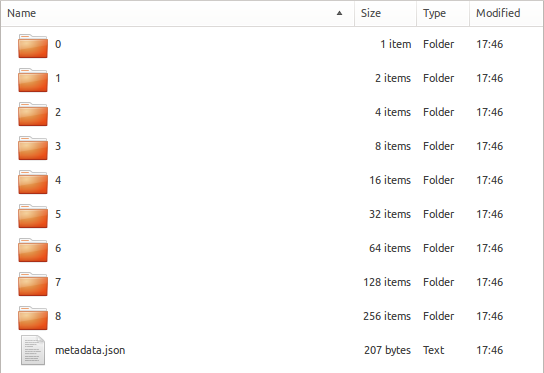 Add a folder with a version number on it, e.g. v1. This is important because if you ever update your map tiles, you could end up with old, stale versions cached. The easiest way to avoid this is adding a version to the path. Inside your version folder, upload the contents of your map. 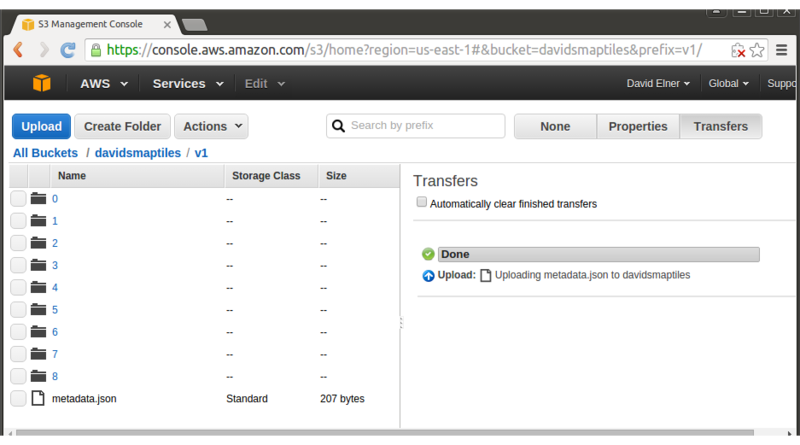 Then create a new CloudFront distribution for your S3 bucket. Optional: create a CNAME record in your DNS zone to point to the CloudFront distribution. 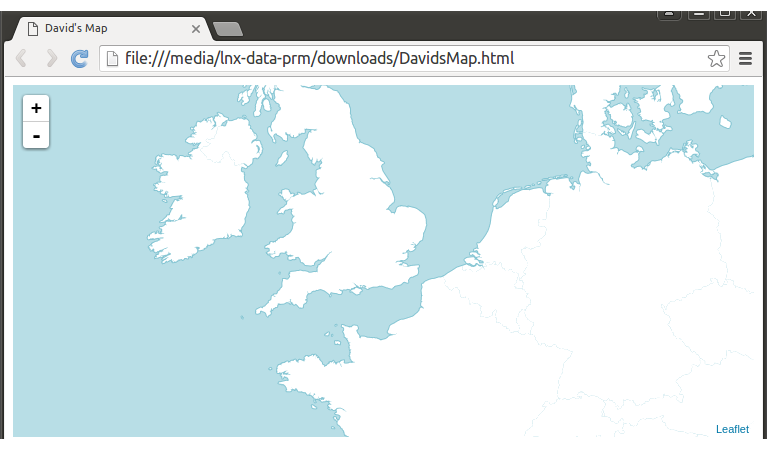 Update the tile layer URL in your Leaflet map to use the new CloudFront host. And that's it: you now have your own custom slippy map that can scale easily and cheaply with your traffic. OpenStreetMap: Awesome, free, open-source map. TileMill: Application for styling and generating map tiles. mbutil: Tool for converting MBTiles (map tiles) to PNG. Creating your own tiles: Some alternative means of generating map tiles. Software engineer, designer, and amateur photographer.